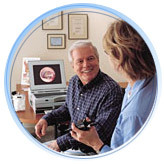 A complete case history, including medical questions, questions about your hearing, and your previous hearing aid use. A visual examination of your ear using an otoscope. Tests of your ability to respond to a variety of sounds. Tests of your ability to recognize and repeat spoken words. In some cases, a test of the mobility of your eardrum, and hearing reflexes. All Beltone practitioners strictly adhere to all federal, state and local regulations regarding hearing instrument dispensing protocols, and follow nationally accepted testing guidelines of the American Speech Language Hearing Association, the American Academy of Audiology, and the International Hearing Society.